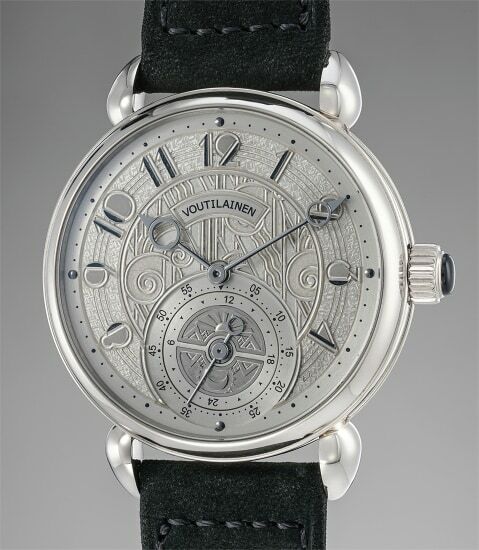 After spending a decade restoring the finest horological creations of the past three centuries, Kari Voutilainen became a rising star in the watchmaking scene in the early 2000s with his unique piece decimal minute repeaters that chimed every ten minutes and no longer the quarter hours, contrary to all repeating wristwatches available at the time. These watches were soon followed by his Observatory and Vingt-8 models with a movement finish often compared to that of the great Philippe Dufour. With the present unique Vingt-8 GMT, Kari Voutilainen manages to perfectly balance the horological tradition of the movement and unbridled creativity of the dial. What immediately strikes the eye is the superb hand engraved dial with Art Deco numerals and background giving the watch an irresistible seductive attraction. The motifs on the dial dance and sway depending on the angle of the light shining on it, bringing the dial to life in a playful manner. The dial is not the only work of art in this watch, the movement is a superlative example of Voutilainen’s mastery. Fully conceived, created and assembled in Voutilainen’s ateliers in Môtiers (Switzerland) where Kari and his team make about 50 watches per year, this apparently simple movement features a complex direct impulse escapement enabling a more constant distribution of energy. Furthermore, the extra-large balance allows fine regulation of the watch using a rare balance spring system with the exterior of the spring using a Breguet overcoil, while the internal curve uses the little known Grossmann curve. Furthermore, every component in this caliber, from the bridges to the tiniest of screws, involves manual labor, may it be adjusted tolerances, polishing, angling and so on. A GMT mechanism is integrated in the movement. Its indicator takes the form of a disc at 6 o’clock. The disc shows 24 hours and includes a day/night indicator. The triangle transferred to the subsidiary seconds dial represents the index by which the indication can be read. The disc is advanced by pressing the crown, each press moving the disc forward one hour at a time. In unworn condition and made as a unique piece, this highly collectible watch from one of the greatest living contemporary watchmakers is sure to find a place of honor in any collection.